Often referred to as the 'silent killer', Carbon Monoxide (CO) is the leading cause of deaths attributed to poison in the United States. It is odorless, invisible and an extremely dangerous gas that can be emitted from everyday appliances to the car parked in your garage. Universal Security Instruments has recognized the lethality of CO and has outfitted its online store with all of the necessary equipment needed to eliminate any sort of lingering doubts and assure you the ultimate in peace of mind. 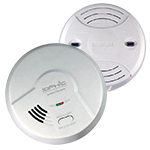 The Hardwired Universal Smoke Sensing Smart Alarm with Smoke, Fire, Carbon Monoxide and Natural Gas Detection is the ideal choice for those looking for maximum protection. 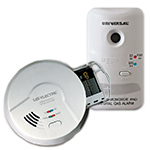 This 4-in-1 Alarm is able to quickly register and respond to the threat of fast-flaming fires, smoldering smoke, carbon monoxide and natural gas. This can be absolutely vital in giving you and your family an optimal amount of time to escape your home in the event of a fire or CO leak. 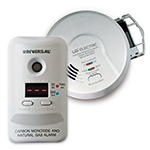 USI's Carbon Monoxide Alarms come in a variety of models and employ various technologies to better recognize potential threats looming within your home or place of business. Due to their innate versatility, the following list has been composed to best represent each alarm's capabilities.